Adam Gilchrist signed off his IPL career with lone wicket of Mumbai batsmen Harbhajan Singh at Dharamshala. 51 needed in last six balls, celebrated Australian wicketkeeper Gilchrist decided to bowl and pacer Praveen Kumar was keeping the wicket. Gilli bawled offbreaks, pitched slightly outside off stump and turning a bit, Harbhajan tried to slog it over long-on and found Gurkeerat in its way. 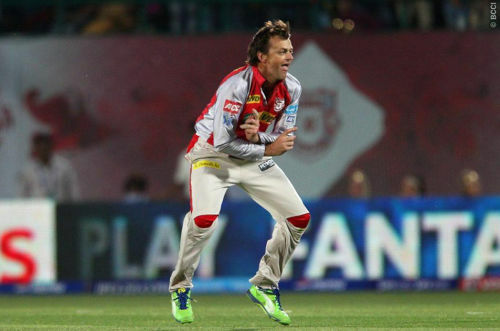 Then Gilchrist was seen in a celebrating mood and showed some entertaining Gangnam-style moves. Earlier, Kings XI Punjab won toss and decided to bat first. Punjab start poorly as its both openers, Gilchrist and Mandeep Singh were back in pavilion on the score of just six, but after that veteran Azar Mahmood and Shaun Marsh added 148 runs in just 86 balls. Mahmood scored 80 in 44 balls in which he smashed eight boundaries and cleared rope four times. Shaun Marsh also scored fifty; he made 63 in 47 balls with the help of 11 boundaries. Mumbai Indian fielding was not upto the mark as they dropped few chances. While batting, Mumbai too lost to Kings XI Punjab pacers as they chipped away with six important wickets. Mumbai’s non-regular openers, Maxwell and Aditya Tare fell inside the first four overs. Ambati Rayudu, who was promoted at number three couldn’t covert his start and gloved a bouncer through to Gilchrist. He made 26 in 22 balls. Inform batsman Dinesh Karthik was deceived by Chawla and caught and bowled on duck. Captain Rohit Sharma shown some restrain and tried to revive inning with Polard, but in twelfth over Chawla bowled Sharma on 25. Then Pollard and local boy Rishi Dhawan tried to come closer to Punjab’s score, but under the pressure of rising asking rate Mumbai batsman couldn’t counter Punjab’s bowlers at small Dharamshala ground. Despite this healthy win, Kings XI Punjab couldn’t qualify for the play off. 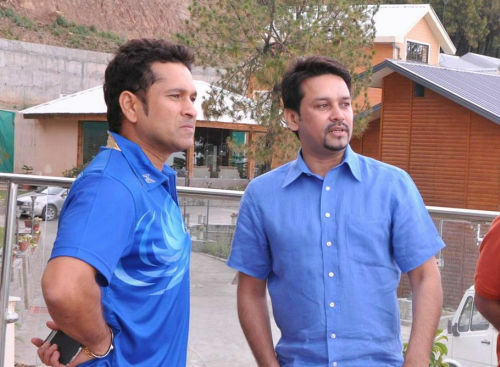 For this match, HPCA stadium was jam packed to see Cricket legend Sachin Tendulkar in action, but due to injury he couldn’t play this game.